Debt is the new four-letter word. After being the economy’s best friend for the past half century, debt leverage has now become cursed as governments, corporations and individuals come to grips with ridding themselves of its heavy burden. While the issues regarding the world’s debt situation are simply too many to repeat here, our intent is to assess how we believe portfolios should be constructed to weather the leverage storm. 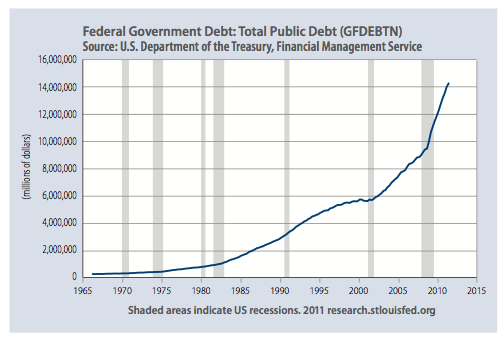 The chart shows the accumulation of debt by the US government, which is now above $14 trillion and growing faster than the economy as a whole. We’re not just singling out the United States; the chart looks similar for most developed countries, particularly in Europe. What has spooked markets of late is the simple fact that investors in debt securities are asking themselves “how do we get our money back?” The presumed safety and security of owning a government-issued bond (the assumption is that a government can always raise taxes to meet interest and principle repayments) is being put to a severe test, especially in Europe, as countries like Greece grapple with how to bring budgets into balance.